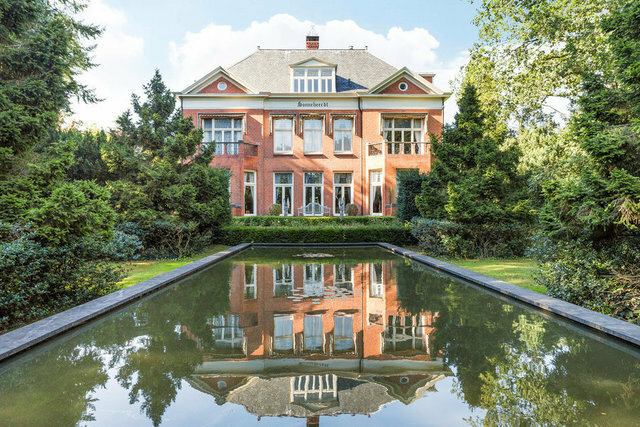 The stately manor house Villa Sonneheerdt, built in 1910/1911, occupies pride of place in Hilversum’s most desirable residential area, Nimrodpark. Sonneheerdt was built in the neoclassical style to a design by the architect E. Verschuyl. The Nimrodpark area is unique in the Gooi region, since other houses of this period and class were generally constructed alongside busy main roads. The plot is roughly 1.1 hectares, with the red-brick monumental mansion located at the centre and an impressive pond at the front. The house itself has floor space of some 1,250 square metres and a volume of around 5,000 cubic metres. Despite its generous proportions, it is still a welcoming family home with traditional sliding doors and its original stained glass windows and parquet flooring. The villa and its railings have been listed as a national monument since 2000, entitling the owner to the associated tax benefits.